SAN SALVADOR, El Salvador (CNS) — The legacy of six murdered Jesuit priests, their housekeeper and her daughter lives on in El Salvador. 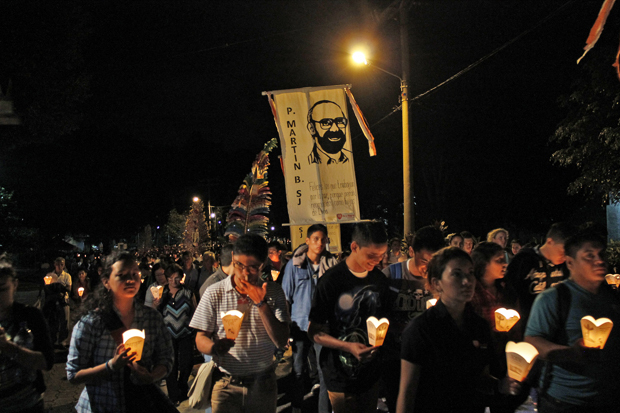 Jesuits from Central America and other parts of the world, along with hundreds of parishioners, commemorated the 25th anniversary of the murders. For demanding social justice in a country marked by abject poverty, and in the midst of a civil war, the six Jesuits were considered the left’s ideologues by the right-wing sectors of the country. “Twenty-five years later it is clear that the victims of the war in this country need justice; we also need more economic equality,” said Jesuit Father Rodolfo Cardenal, former vice rector of Central American University, site of the 1989 murders. On Nov. 16, 1989, in the midst of the biggest offensive launched by the guerrillas of Farabundo Marti National Liberation Front, a commando unit of the Salvadoran army killed Jesuit Fathers Ignacio Ellacuria, Ignacio Martin-Baro, Segundo Montes, Amando Lopez, Juan Ramon Moreno and Joaquin Lopez. Elba Ramos, the cook and housekeeper, and her 16-year-old daughter, Celina Ramos, also were murdered. The weeklong commemoration of their deaths included talks, cultural activities and radio and television programs, culminating Nov. 15 with a Mass celebrated by Jesuit Bishop Gonzalo de Villa Vasquez of Solola, Guatemala. The 1980-1992 Salvadoran civil war left an estimated 75,000 dead and 8,000 missing. Ivette Escobar, a marketing student at Central American University, said the priests’ deaths were not in vain, and the legacy she has taken is to continue the struggle for the defense of the poorest in the country. “They were an example of how one should pursue justice for others,” she said to Catholic News Service, while making a colorful rug with the faces of the murdered priests. Delegations of communities that bear the name of some of the murdered priests also participated in the activities: for example, the “Comunidad Segundo Montes,” founded in November 1989 by Salvadorans who returned after fleeing to Honduras; they settled in the northern department of Morazan. Father Montes was a prominent sociologist who, in the 1980s, began to study the phenomenon of migration and human rights. He was the founder of the university’s Human Rights Institute, the main center for free legal aid. The “Cooperativa Martin-Baro” in Jayaque is another example of the martyrs’ heritage. Father Martin-Baro taught social psychology and founded the university’s Public Opinion Institute, aware of the importance of measuring the mood and opinion of the population. In 1986 he was the first to conduct a survey that reflected the view of Salvadorans about the civil war, recalled Jeannette Aguilar, director of the institute. “Twenty-five years have passed and it is still essential — the need for pollsters that have a rigorous and independent view of our society … Martin-Baro’s father picked up the voice of the people,” said Aguilar. Father Ellacuria’s academic work was given to UNESCO’s Memory of the World program. The priest was a philosopher and proponent of liberation theology. During this 25th anniversary year, the U.S.-based John Joseph Moakley Charitable Foundation donated $100,000 to Central American University to fund educational programs. The Association of Jesuit Colleges and Universities donated $25,000. The Jesuits’ killers still have not been brought to justice. In May 2011, a Spanish judge issued an international arrest warrant against nine Salvadoran officers accused of plotting to kill the Jesuits, five of whom were Spanish citizens by birth. But El Salvador refused to extradite the defendants, arguing that the 1993 amnesty law did not allow it. Human rights organizations have said that crimes against humanity should not be included in amnesty laws.